Does the "5 Second Rule", of picking up a piece of food from the floor, work? Title: Find out if the "Five Second Rule" of picking up a piece of food that has dropped on the floor within 5 second eliminates the possibility of germs on that piece of food. Description: Pieces of food are dropped on the floor for different time periods and the food samples are placed in Petri dishes to test for bacteria. 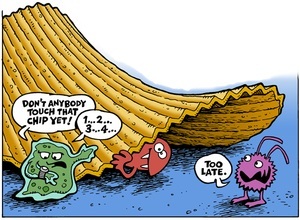 A common superstition, the five-second rule states that food dropped on the ground will not be contaminated with bacteria if it is picked up within five seconds of being dropped. Some may earnestly believe this assertion, whereas other people employ the rule as a polite social fiction that will allow them to still eat a lightly-contaminated piece of food, despite the potential reservations of their peers. There are many variations on the rule. Sometimes the time limit is modified. In some variations, the person picking up the food arbitrarily extends the time limit based on the actual amount of time required to retrieve the food. In Russia there exists a similar rule: "Promptly picked up is not considered fallen". The five-second rule has received some scholarly attention and has been studied as both a public health recommendation and as a sociological effect. In 2003, intern Jillian Clarke of the University of Illinois at Urbana–Champaign found in a survey that 56% of the men and 70% of the women surveyed were familiar with the five-second rule. She also determined that a variety of foods were significantly contaminated by even brief exposure to a tile inoculated with E. coli. On the other hand, Clarke found no significant evidence of contamination on public flooring. Clarke received the 2004 Ig Nobel Prize in public health for this work. A more thorough study in 2006 using salmonella on wood, tiles, and nylon carpet found that the bacteria were still thriving after twenty-eight days of exposure under dry conditions. Tested after eight hours' exposure, the bacteria could still contaminate bread and bologna in under five seconds, but a minute-long contact increased contamination about tenfold (with tile and carpet surfaces only). The five-second rule was also featured in an episode of the Discovery Channel series MythBusters. There was no significant difference in the number of bacteria collected from 2 seconds exposure as there was from 6 seconds exposure. The moisture, surface geometry and the location the food item was dropped on did, however, affect the number of bacteria. Ted Allen put the rule to the test in an episode of Food Detectives, and found that bacteria will cling to food immediately. High traffic areas will lead to even more bacteria on the food. As a popular superstition, the five-second rule pops up frequently in popular culture, including appearances in the live-action/animated film Osmosis Jones, Grey's Anatomy, The Late Late Show with Craig Ferguson, Arthur, Bucket & Skinner's Epic Adventures and The Simpsons.